When it comes to selecting a dress for any special event, it can be really hectic and mind boggling specially if you also have your academics to attend while searching a perfect dress. It is better to have wide collection of choices at one point then moving shop to shop while looking through some options at a time. If you want huge choices of options then there is nothing better then a reliable online store. Sherry London is such online store where you can find dresses for Prom, Bridesmaid, Cocktail party, Evening and Homecoming. I have already talked about their Evening Dresses Collection and today i am going to talk about their prom dresses. Currently the lace dresses have become very popular for any events. They give stylish, sophisticated and luxurious look. 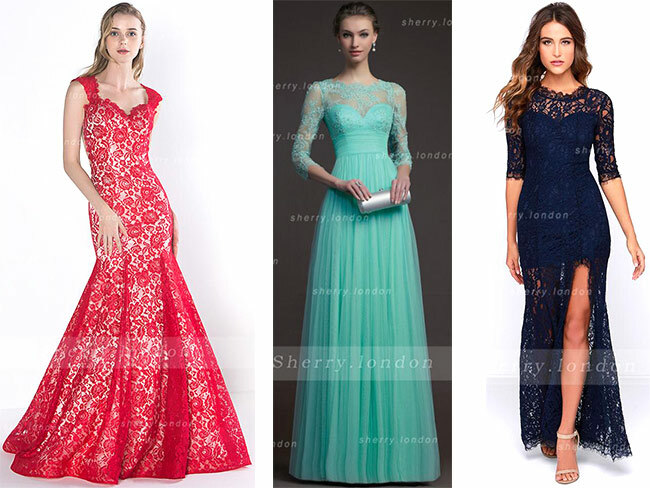 At Sherry London you can find lace prom dresses of latest fashion and trend. While selecting dress with lace you have many options. You can either pick a dress which is made of whole lace design with same color lining or different color for enhancement. This style gives you more glamorous look and make you stand out. On the other hand you can chose the dress which have lace on bodice and sleeves only if you are choosing dress with sleeves. This style gives you more younger and edgy touch while making prominent only top of dress. At Sherry London you can find wide collection of cheap prom dresses with many color and designs to choose. Their prices let you pick a dress of your dream with in your pocket range. The prices may be low but they promise to provide high quality material with embellishment of latest design and fashion. You can pick the dress in your price range and then choose the alteration of your choice like size and color. Sherry London have improved their website and have made it easy to navigate and select the dress. They have added 2017 prom dresses to their collection so you can have access to latest fashion and trend. While you have access to their latest collection, you can also select color, size and time of tailoring as well. So pick any dress and make your prom special this year.